Trials is the recently released EP by the New Jersey Metal band, Julius Seizure. The album kicks off with a dramatic transition from a sample of a judge’s incriminating gavel, to a full on thrashy, harshly vocalized attack on your eardrums. It incorporates punky elements suggesting influence by Escape The Fate, Endicott, and other early Metalcore. The clean singing is melancholy without being too melodramatic, and the lyrics are tantalizingly ambiguous. the riffs are high pitched and wailing, and the drumming is steady. In fact, the album is consistently solid. 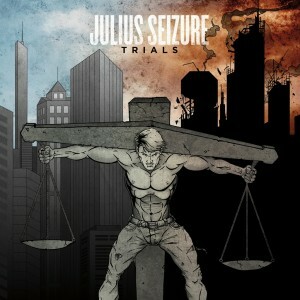 However, Julius Seizure utlilizes thrashy riffage, double-layered melodies, and of course, the inevitable breakdowns . Sixth And Falling is my favorite track from Trials. The opening riffs are catchy, and the dynamics of the overlapping melodies kept me on my toes. The instruments and vocals seem to syncopate. This is the most virtuosic song on the whole album, incorporating elaborate progressions. However, this virtuosity is tempered with ludicrous amounts of screams and breakdowns. The resulting tension between harmony and dissonance is a striking contrast. The album as a whole exhibits a variety of influences, ranging from Metalcore to Nu-Metal. Definitely worth a listen. Check them out on on Bandcamp, where the EP is available for purchase in both digital formats and hard copy.